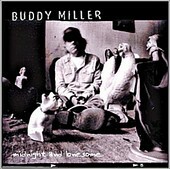 Buddy Miller comes off like a redneck Bob Dylan with the drawn out whine of "The Price of Love" the opening track to Midnight and Lonesome. This music has all the tell tail signs of Country Music with the bad luck and heavy drinking. The mournful ache of "I Can't Get Over You" leaves a calm over your soul and demonstrates Miller's masterful crooning. The album spreads its wings to cover all kinds of musical styles including the boogie-woogie blues crossed funk of "When It Comes To You." Miller's voice has a country feel but his music doesn't neatly any category and that's why it's so enjoyable. Rating: B-.